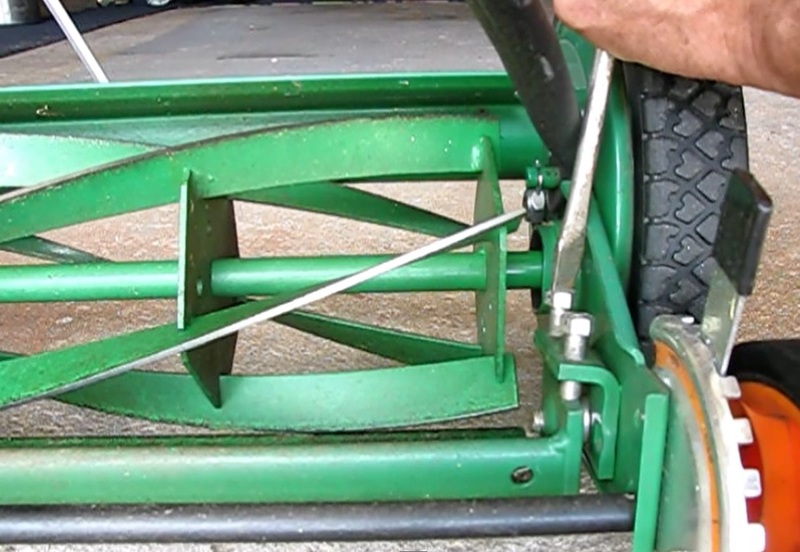 Reel mowers quietly deliver excellent service, but do occasionally need a good sharpening. This post will show how easy it is to sharpen one of these useful and environmentally friendly machines. Tools: Sharpening kit, screwdriver, brush; optional: drill and socket. Materials: sharpening compound, solvent such as lacquer thinner. 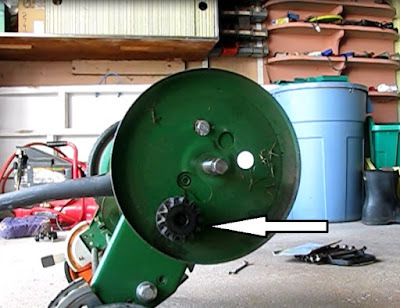 1) Test the mower's cutting action with a piece of paper. If it fails to cleanly cut the sheet, it needs sharpening. 2) Lower the cutting reel by loosening the inner bolt just a bit (counter-clockwise) and tightening the outer an identical amount. 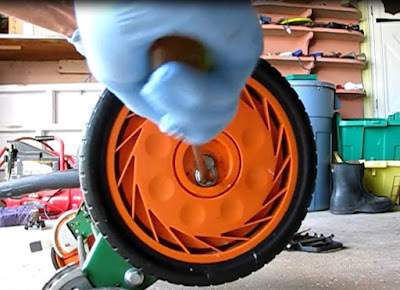 This will result in contact between the reel and the cutting edge needed during sharpening. Repeat on the other side. 3) Tip the mower so that it rests on the rear wheels with the handle on the ground. 5) Remove the "C" clip with a flat blade screwdriver. 7) Remove the pinion gear, being careful not to lose the little dog that rests freely now in the axle slot. 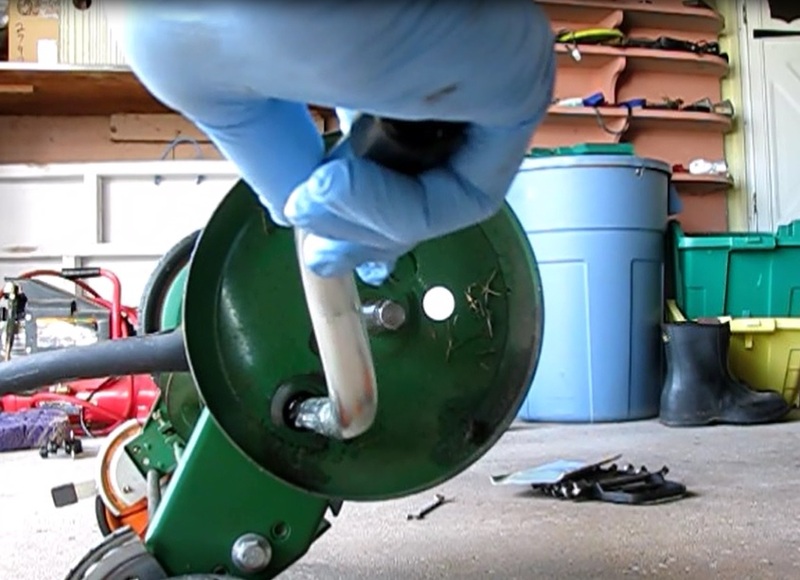 Under the pinion gear is a little "dog"
8) Place the hand crank over the drive axle. 9) Coat the cutting edges of each of the 5 blades with sharpening compound and rotate crank slowly and steadily in the reverse direction from mowing. Continue for 8 minutes. 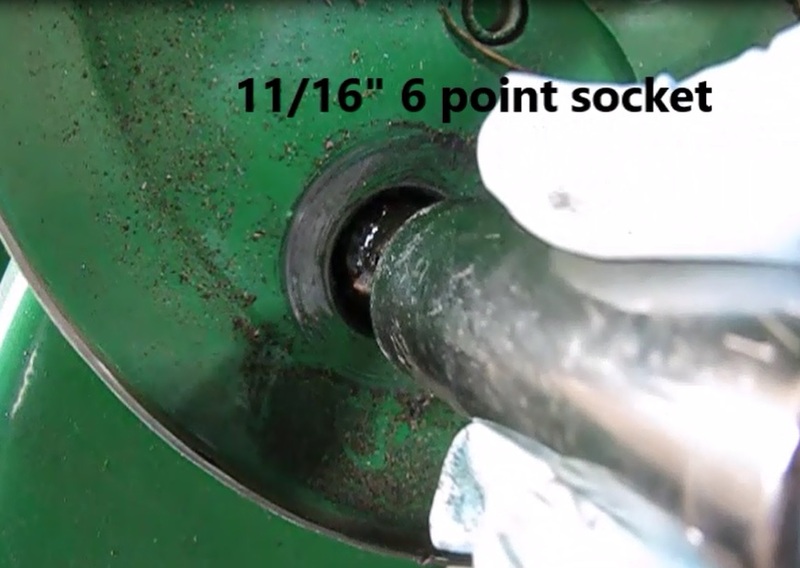 Optional: use a 11/16 deep well 6 point socket, a chuck socket adapter and a drill. 10) Clean off all the compound with a solvent soaked rag. 1) Install the pinion gear. 3) Push on the "C" clip with the screwdriver. 5) Test with paper to confirm cut. If necessary repeat the procedure. 6) Enjoy some clean, quiet cutting.